When the earth was flat and the seas teemed with monsters... The monsters of old naval charts have been brought to life and made concrete at the Maritime Museum of Finland in an exhibition that promises both discovery and play. For many, the seas are foreign and frightening, their depths forever out of reach. 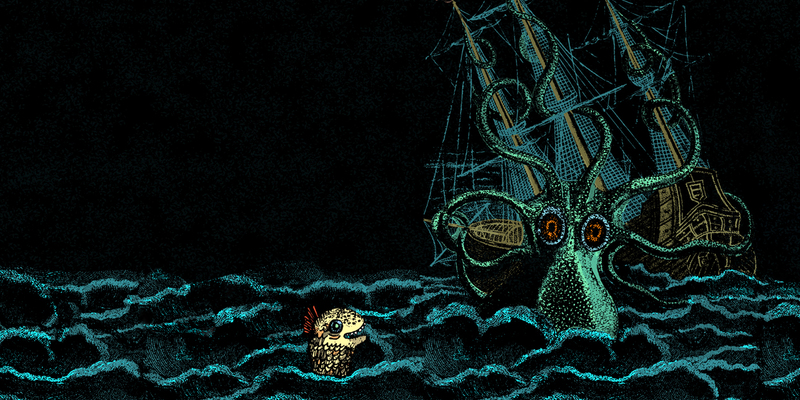 It is no wonder then, that stories about strange sea monsters have existed as long as seafaring. Sea Monsters takes the whole family to the dangerous waters of the Carta marina map (1539), mixing historical facts with mythical monsters of the sea and transporting you to an age when seafarers were lured to unknown lands by poems and stories. Visitors can look forward to encountering a giant sea serpent and a bloody sea cucumber, discovering the primordial sea through a diving bell, visiting Dr. Pontoppidian’s museum of strange creatures and studying ancient sea routes and navigation devices. The exhibition has been created by author Laura Ruohonen and illustrator Erika Kallasmaa, an internationally renowned and awarded team who have created illustrated poetry books that have become modern classics among children and adults alike. Ruohonen and Kallasmaa were also among the nominees for the 2019 Astrid Lindgren Memorial Award. Even though the sea monsters of old have disappeared from maps, the seas and our beliefs, a new monster species has emerged – one made of plastic rubbish. By one estimate, there are more than 150 million tonnes of plastic rubbish in the seas of the world, from where some of it ends up in the digestive systems of birds and fish, and shards of plastic have even been discovered from bottom-dwelling organisms. In the yard of Maritime Centre Vellamo, work is underway on the setting up of artist Alexander Reichstein’s Leviathan. Commenting on the pollution of the seas, the sea monster themed work will be finalised in the spring with plastic rubbish in cooperation with a local school and adult upper secondary school. Reichstein has often created art for and with children, and in 2008 he was awarded the State Prize for Children's Culture. The exhibition also showcases items related to seafaring from the Maritime Museum of Finland’s collections, including compasses, binoculars and model ships. In addition to this, the exhibition also features specimens from the collections of the Finnish Museum of Natural History, including puffer fish, seahorses, a sea cucumber, anglerfish, sharks, clams, octopuses and other wondrous sea creatures. The exhibition’s diverse event programme for the whole family kicks off on Saturday 13 April 2019 with the Children’s Vellamo event at Maritime Centre Vellamo. The Sea Monsters exhibition was designed by architect Tuomas Siitonen, with graphic design by Johannes Nieminen. The sound design was handled by Markus Lindén and the lighting design by Jarkko Forsman. The animation used in the exhibition was produced by Maippi Ketola. Metalwork on Leviathan by Kirsi Vahtera / Routa Design. The exhibition will be accompanied by the non-fiction book Merihirviöt – Merenneidosta mustekalaan published by the John Nurminen Foundation, which sheds more light on the myths and tells facts far stranger than fiction about the creatures of the sea. The book was written by cultural historian Otto Latva who recently defended his doctoral thesis on the subject at the University of Turku. Sea Monsters is open at Maritime Centre Vellamo in Kotka from 12 April 2019 to 17 January 2021.